Friday night + England v Wales + Premier League ground! Evenings don’t get much bigger than that as over 25,000 people descended on Southampton to watch England take on their neighbours, Wales, in the latest FIFA World Cup qualifier. On paper, the Lionesses are the stronger side. Second in the world compared to Wales’ 34th position, with all players and staff fully professional. But, as I warned some friends beforehand, these derbies tend to tear up every script in the book, an aspect of football that makes it so unpredictable and entertaining. England came into the game in good form after a strong showing at the SheBelieves Cup in March. Their qualifying campaign had gone without a hitch so far, winning three games out of three and scoring 15 goals to no reply. Wales, however, have also been flying in qualifying, earning three wins and a solid point away in Russia. Their solidity in defence and ability to pinch a goal would have meant Jayne Ludlow’s side came into this match brimming with confidence. With the return of Jordan Nobbs and Steph Houghton from injury, Phil Neville was able to name his captain and vice-captain in the starting line-up for the first time. In the absence of Millie Bright through injury, Abbie McManus retained her position in defence while Carly Telford was given the number one jersey for the evening. Ludlow named a starting eleven that illustrated their approach to the game, not to concede. With the inclusion of the strong defensive figures of Hayley Ladd, Loren Dykes, Rhiannon Roberts and Sophie Ingle, they set up to be a team that would be tough to break down. With the pace of Natasha Harding and attacking strength of Kayleigh Green, there was always the hope that they could produce a swift punch on the counter. With teams welcomed onto the pitch by a buzzing crowd and a tribute to the late Ray Wilkins complete, the game got underway. It was the Welsh who had the first real chance of the game and boy was it close! After Roberts had forced Telford into clearing for a throw, the ball was defended for a corner. The delivery fell to Harding in the box who tried to poke it home. It deflected off Houghton before Lucy Bronze scrambled it off the line but there is much debate over whether it had gone completely over. 10 replays later and it was eventually concluded it had but to be fair to the assistant, there was no way she could have seen that through the bodies in a split second. From that point, England dominated the ball. Toni Duggan was proving to be a livewire out on the left and forced Laura O’Sullivan into the first of several world class saves. The Welsh keeper then somehow got a hand on a Nobbs curler that looked for all the world to be destined for the top corner. The second half told much the same story although England came racing out of the blocks. 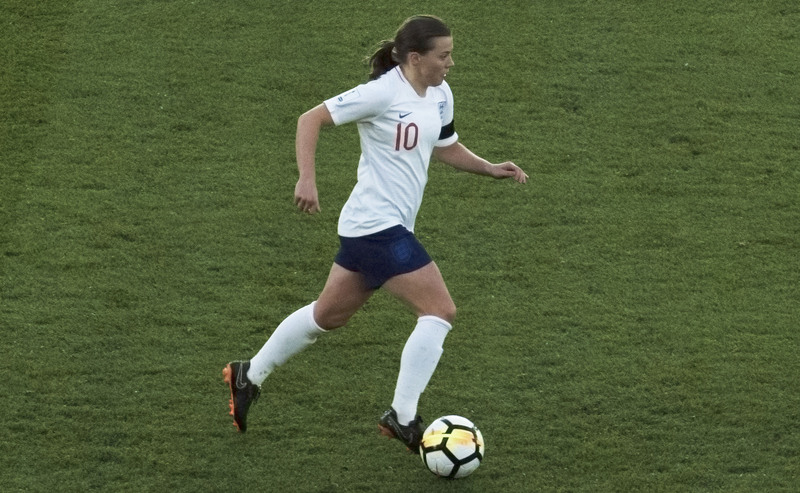 Neville made two early substitutions, bringing on Melissa Lawley and Ellen White, and they immediately added extra impetus to the England attack. White’s first real chance saw her divert a cross from Bronze wide before forcing O’Sullivan into another top class save. 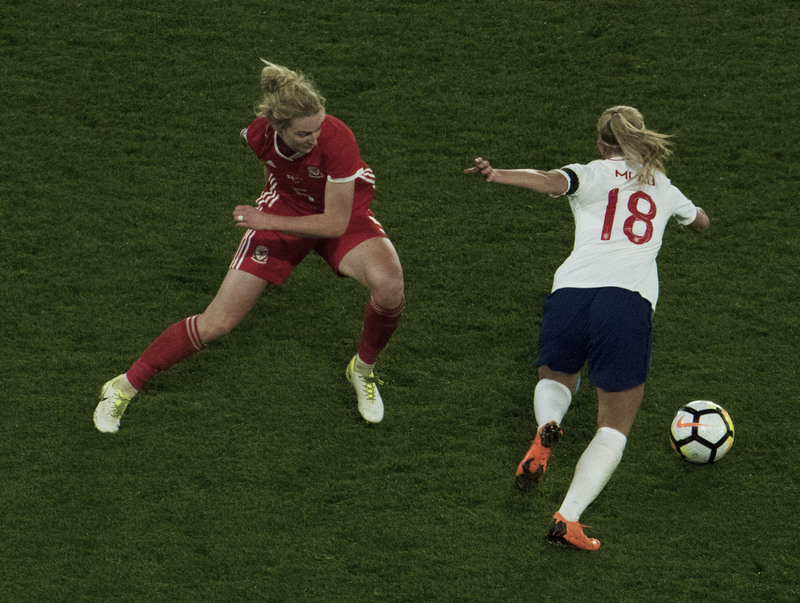 Beth Mead was handed her senior debut and added more energy to England’s attack but the Welsh defence were there to block anything coming their way. The desire they put in was epitomised by their captain Sophie Ingle, who despite picking up a bash to the nose, threw herself in front of anything coming her way. There was one more top save from the Welsh keeper that kept the tie squared as she denied Fran Kirby. The final whistle blew and the Welsh jumped in celebration. This was a big deal for them – they did exactly what they set out to do and put their bodies on the line to achieve it. England on the other side were frustrated, knowing they should have done more to break down such a defensive unit. They were dominant in all aspect of the game – possession and chances – but could not find the composure, and at times the luck, to finish them off. They move onto Bosnia & Herzegovina on Tuesday as they play their game in hand for a chance to go top of Group 1. It won’t be easy; Bosnia will line up much the same way as the Welsh and try to make it hard to break through. The Lionesses will need to find something extra to come home with an essential three points. Wales performance epitomised fighting spirit as well as defensive capabilities. They set up to frustrate the English attack and from the first to the 90th minute did their job fantastically. It was obvious that, for whatever reason, England’s normal intensity wasn’t there in the first period. But with the substitutions in second half, they came out with renewed intensity and threw everything they could muster at the Welsh defence. “I wasn’t happy with the first half performance – I thought we were sloppy in possession which isn’t like us as we trained really well all week. We didn’t play with any speed or intensity, we gave away careless passes and their game plan worked. I thought we were fantastic in the second half. We kept them penned in their half; we played with speed, we created one-on-one situations in wide areas and we were the only team that was looking to win the game. But you have to say they defended unbelievably. It was a fantastic performance by Wales. As an opposing manager, you have to hold your hands up and say they played really well. They showed tremendous spirit and we didn’t break them down. With the introduction of Ellen White and Melissa Lawley immediately after the break, England’s intensity and directness increased significantly. White is one of those players you love to have on your team; someone who will hassle and harry and chase down every ball as well as having the ability to create and score chances. 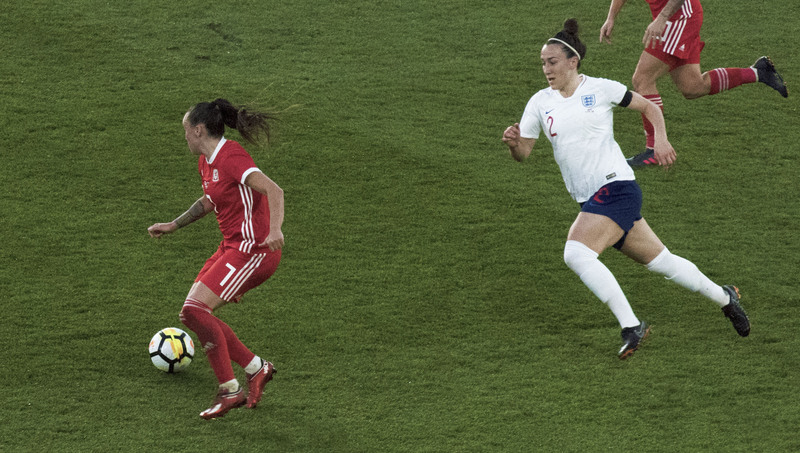 Lawley meanwhile had probably the biggest impact of any player on the pitch with her turn of pace down the left proving problematic for Wales’ tiring defenders. Beth Mead added the same when she came on, with a directness to her play for which she is known. One point on which we disagree with Neville is short corners. We don’t think there is a tactic we hate more in football than the short corner. England’s persistence in short corner routines throughout the game was a frustration. With short corner after short corner going astray, Nobbs finally decided to throw some into the box in the last 15 minutes. It immediately put O’Sullivan under pressure and with the likes of Houghton in the centre anything can happen. Short corners; don’t do them! What can be said about the Welsh keeper?! Named player of the match (and rightly so), she had one of those days as a goalkeeper where you get to everything. She saved Wales on multiple occasions throughout the match, making top saves, throwing herself at crosses and was not afraid to take a hit or even take out her own defenders. “I love her! She started playing 3 or 4 years ago. A big part of our development has been our goalkeeper coach, Jon Horton. He puts a lot of time and effort into their development and she is one that is benefiting from it. We hope that this leads onto other things for her. For us, we need more players playing at the top level and she is certainly one that could be doing that. Tagged england, England women, Fifa world cup, football, football blog, International football, Jayne ludlow, lionesses, Phil neville, wales, women's football.